I’m slightly ashamed to confess that I don’t quilt. I’ve resolved to take a beginner’s class at the Stitchin’ Post for years now, but I have never pieced together a block and I have only a vague notion what a bobbin is. I’m part of the Two Rivers Three Sisters quilt project because I work for the National Forest Foundation (NFF), a nonprofit that brings people together to restore and enhance our National Forests. 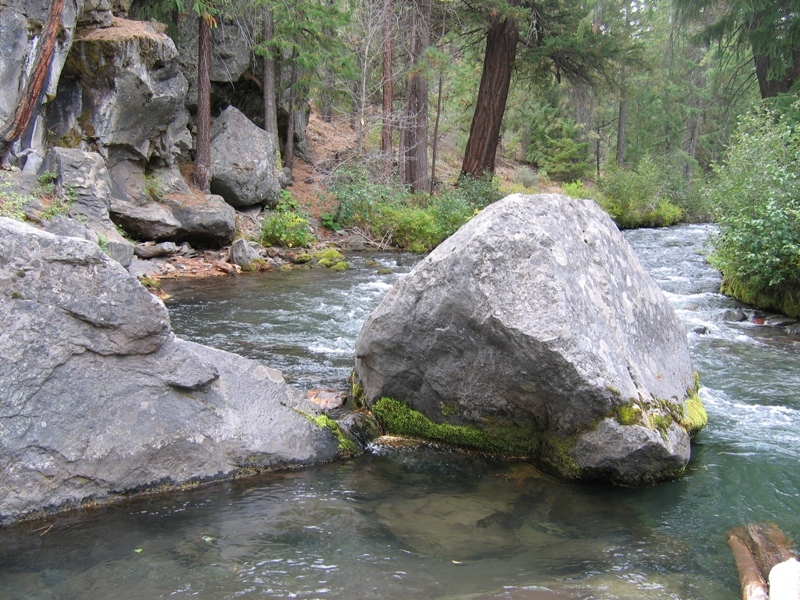 NFF chose Sisters, more specifically Whychus Creek and the Metolius River, as a special site—a Treasured Landscape site—called the Tale of Two Rivers. In collaboration with many partners, NFF is working to restore our watersheds, bring back salmon and steelhead, and engage the community throughout the process. The stunning Two Rivers Three Sisters quilts raise awareness for Whychus Creek. Half of the funds from the quilt will be given to NFF to go directly to local on-the-ground restoration efforts. This may seem like a funny partnership: quilters and conservationists, together? It’s actually as natural as peanut butter and jelly. The act of quilting is piecing together different fabric to make a unified whole. A talented quilter focuses on each seam, each section, with the big picture in mind. This is also how we restore our watersheds. Piece by piece we work on the banks of the rivers, the trails winding through the forest, and the wildlife habitat—always with the health and unity of the whole in mind. There is an important communal aspect to quilting. During the time they craft, quilters are able to connect with a community—they stitch and laugh in groups, get together for advice, and take classes and retreats with friends. The Two Rivers Three Sisters quilt is a project in which 20 quilters have collaborated and connected, creating over 40 feet of amazing art. The whole is greater than the sum of its parts. Restoration is also communal. 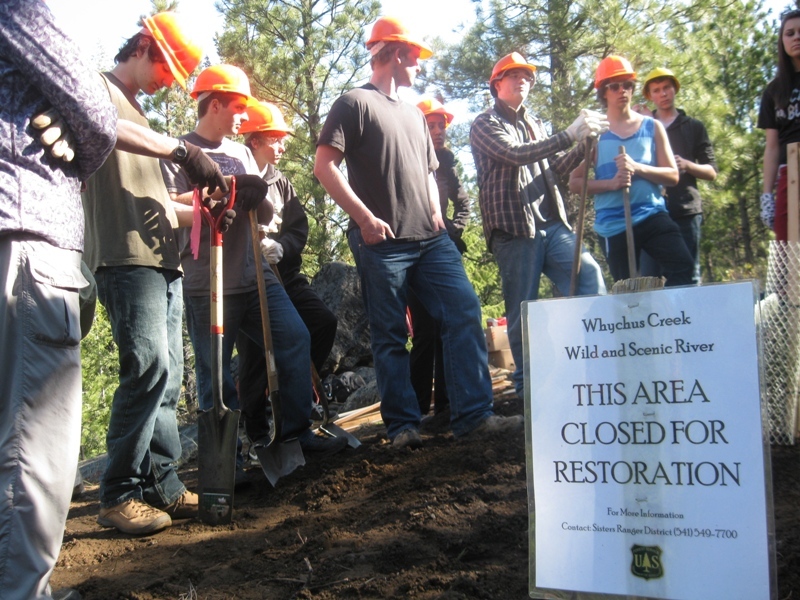 Hundreds of volunteers and donors have made local conservation efforts possible. NFF could not do what it does without friends and partners: the U.S. Forest Service; Deschutes Land Trust; Upper Deschutes Watershed Council; Deschutes River Conservancy; Sisters Trails Alliance; and others. The Sisters Outdoor Quilt Show has been an outstanding partner, helping connect NFF with a new audience and raise awareness of Whychus Creek through Two Rivers Three Sisters. NFF is also grateful to the quilters who have poured hours into this trendsetting project. The quilts go beyond words, they flow together and connect in balance, they are teeming with fish and forests—they represent everything our restoration efforts hope to create. Please join us in honoring these amazing artists and see the completed Two Rivers Three Sisters quilt on exhibit at the Artists’ Reception, June 15, 5 to 7 p.m., Black Butte Ranch Main Lodge. Entry filed under: Uncategorized. Tags: Central Oregon, Metolius River, National Forest Foundation, native fish reintroduction, Pacific Northwest travel, Quilt for Two Rivers, quilters, quilting, Sisters Oregon, Sisters Outdoor Quilt Show, Treasured Landscapes, Two Rivers Three Sisters, U.S. Forest Service, Whychus Creek, Wild & Scenic Rivers. I wouldn’t mind writing a post or elaborating on a few of the subjects you write related to here. Again, awesome blog! Anlässen geht es sehr einfach nicht ohne Hugo Sekt.